For what is considered one of the most powerful civilized countries in the world, it’s hard to believe that so many Americans go hungry. “Even in the world’s greatest food-producing nation, children and adults face poverty and hunger in every county across America,” Feeding America reports. They say more than 41 million Americans struggle with hunger, which works out to about one in seven Americans. What’s almost just as disturbing is that the United States wastes about $160 billion worth of food each year. What’s even more disturbing than all of that is that there have been many reports and claims that world hunger can be solved but the governments of the world don’t seem to prioritize such things. And most restaurants would shun a hungry or homeless person looking for food. 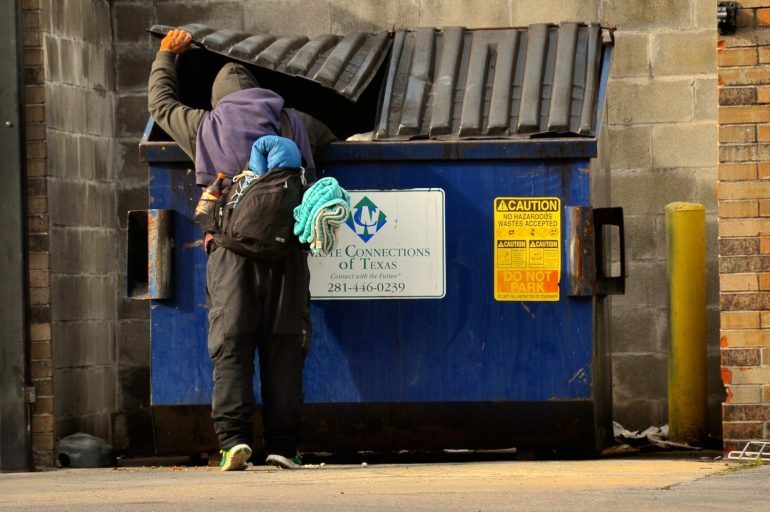 They make sure that they aren’t wasteful and that any extra food they have goes to the homeless. 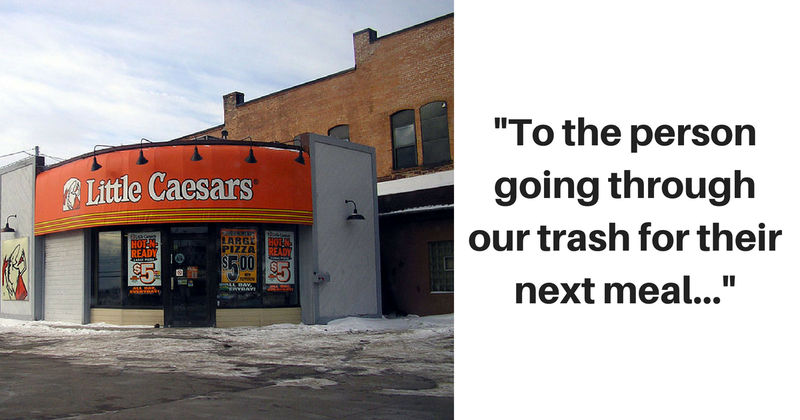 Mike Stevens, who owns the franchise with his wife Jenny Stevens, says he was confused the first time he saw a homeless person rummaging through their trash looking for food. He thought they were employees of another nearby business but then he realized that they were needy and looking for their next meal. He not only wanted to feed the hungry in his neighborhood but he was also hoping to bring them some dignity. Mike decided to invite the hungry in for some free pizza. At first, he was nervous over how his paying customers would react but soon realized that it was all for naught. “We have never one time had a negative comment about it, only positives,” he said. 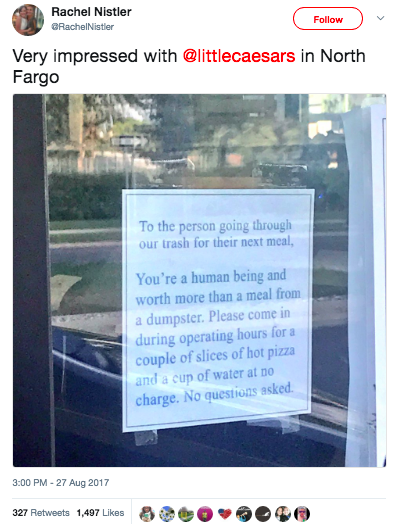 A photo of the sign was posted on Twitter and ended up going viral. 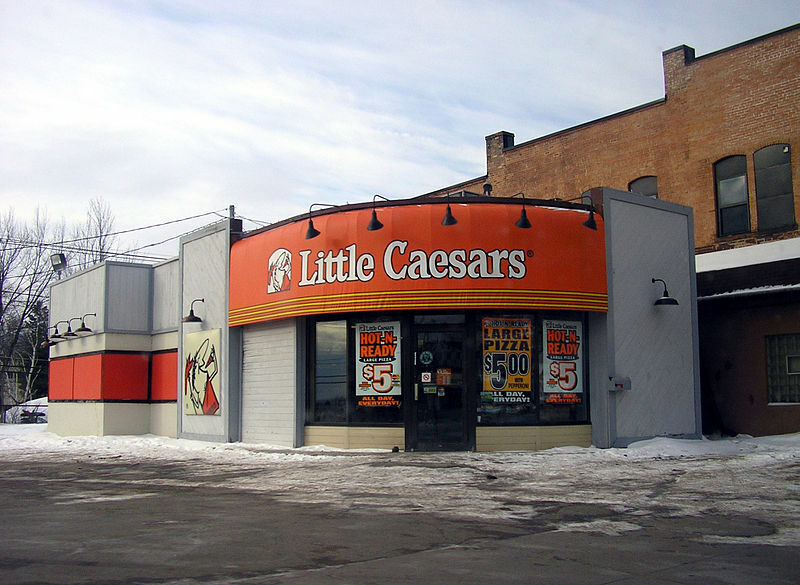 But’s not all this Little Caeser’s does for the hungry in their neighborhood. 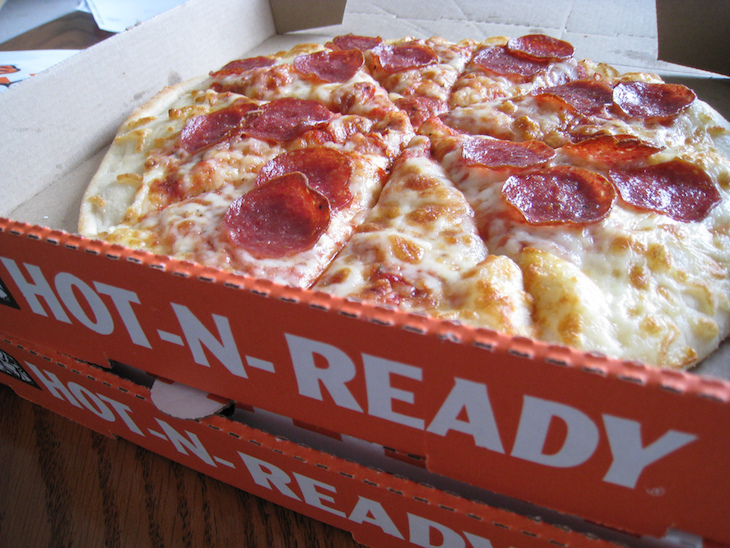 They provide free pizza to the Salvation Army, New Life Center, And Moorhead’s Dorothy Day House. 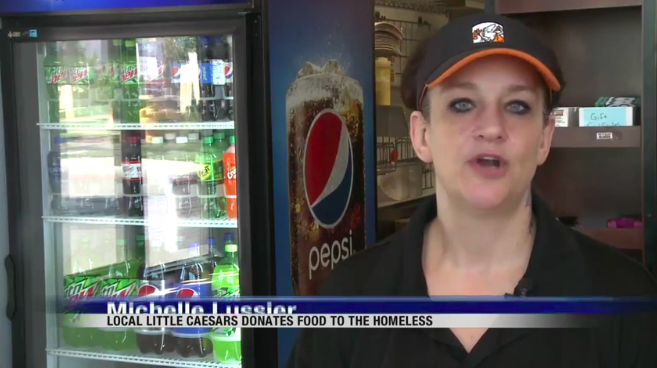 The store makes ready to serve $5 pizzas throughout the day and if the pizza isn’t sold after 30 minutes it’s put in the freezer and given to one of the homeless shelters. 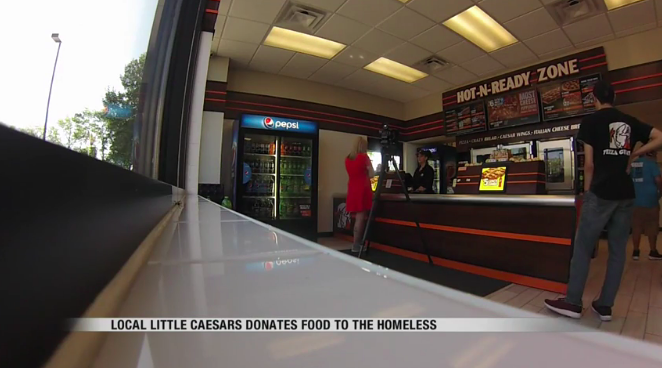 About 15 percent of customers also leave their change in a collection box which is used to buy more pizza for the shelters. 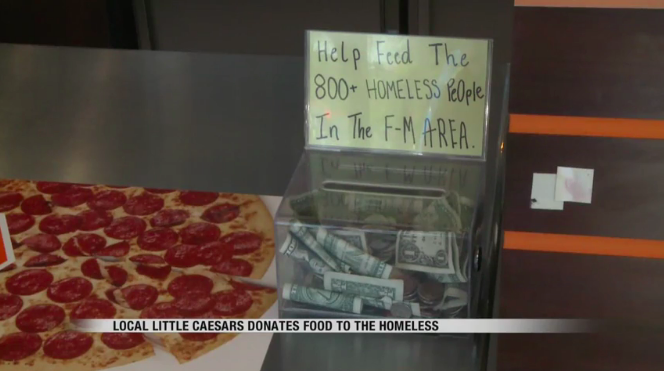 His business has given away more than 90,000 slices. 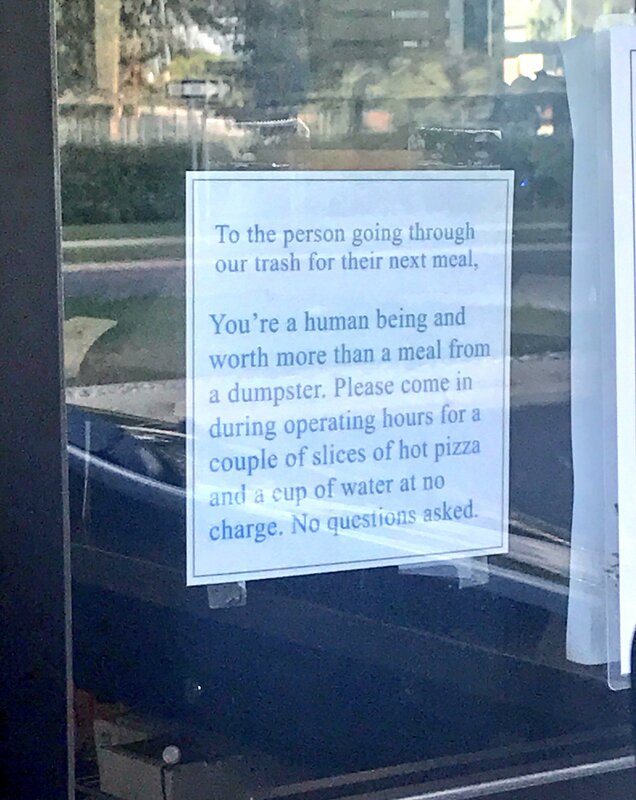 Just imagine if other restaurants took the time to do this!